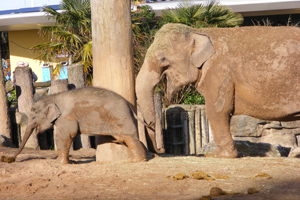 Born Free is calling for a moratorium on the breeding of elephants in UK zoos. The breeding of elephants in captivity in the UK is believed to be unsustainable, meaning more elephants will need to be imported to maintain zoo exhibits. Many captive female elephants have low fertility rates and are unable to conceive, even after repeated matings. Possible causes of shortened reproductive life in zoo females are an increase in pathologies of the reproductive system, for example, ovarian cysts, excess body fat and an early onset of reproduction. No elephants are returned to the wild. Born Free is not aware of any UK zoo that has successfully introduced a captive-born elephant into the wild: we do not think it is likely that any elephant born in the UK will ever be returned.